'We Want The Rail Trail'! Please visit our Facebook page NH Seacoast Greenway Facebook! We would like to Thank all the voters that supported the Rail Trail with their vote on the warrant article! 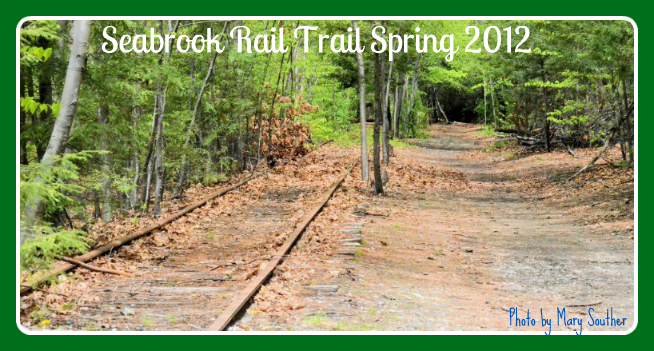 is a vision to build a recreational trail on the rail corridor that runs thru Seabrook! The Rail Trail will be a community asset offering a safe place for children, seniors, and all members of the community to exercise, ride a bike, enjoy nature, or simply get where they need to go without a car such as the library, school, ball parks, Seabrook Recreational Center and shopping centers. The benefits of trails go beyond recreational opportunities for trail users and extend to local businesses, property owners, and communities at large. The total package of benefits that trails can provide to communities includes recreation, public health, transportation safety, economic development, educational opportunities, and even fostering community pride. Help us build the Seabrook Rail Trail! Together, we can make this trail a great community asset! Especially since we have become a destination for NH Tax-free shopping. and there are very few, if any safe roads to walk or ride a bike anymore. Also, not all our children are involved in organized sports and this will give them a safe place to ride a bike, roller-blade with their friends and get out in the fresh air, hopefully becoming fitter while doing so. It will also be a wonderful place for all our citizens including the elderly to get out in the fresh air & sunshine! This may even attract many who may not exercise outdoors currently for lack of a safe venue near their homes. We are gathering a coalition of citizens to make this trail a reality. Please join us! Let's work together to make this a wonderful resource for Seabrook. communicating with NH DOT and other state & federal agencies. Below is a Google interactive map with photos and place markers.